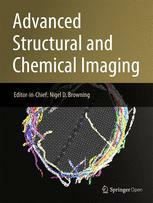 Advanced Structural and Chemical Imaging serves as an interdisciplinary forum covering the entire field of advanced imaging. Particularly welcome are multi-modal studies exploring the links among imaging, diffraction, spectroscopy, data processing, and large-scale data analysis for the purpose of elucidating structure-function and structure-property relationships in atomic and molecular systems. The journal provides a dedicated platform for knowledge sharing among scientists using these imaging and analysis techniques but who may be unaware of important developments in complementary sub-fields. Coverage includes the emerging area of dynamic imaging at various orders of magnitude in spatial and temporal resolution from microns to angstroms and from milliseconds to femtoseconds.